The overload principle of strength training dictates your fitness outcomes regardless of fitness level or exercise goal. For example, proper application of overload separates long term results from wasted gym time. Strength training principles explain theoretical concepts behind sound program design and should be understood. Both novice and experienced weightlifters may increase muscle size, strength and power by incorporating progressive overload into their lifting routines. The overload principle states that body system adaptation fails to occur without an overloading stimulus. Muscles experience overload when exposed to a stimulus greater than normally accustomed to, as stated by the American College of Sports Medicine. In comparison, activity below habitual level causes detraining, while continuing an accustomed lifting intervention maintains your current muscle strength and size. Based on the overload principle, novice -- or previously sedentary -- weightlifters experience muscle adaptation with minimal lifting frequency, intensity or duration. For example, a person unaccustomed to lifting 5 lbs. will improve strength by lifting 5 lbs. 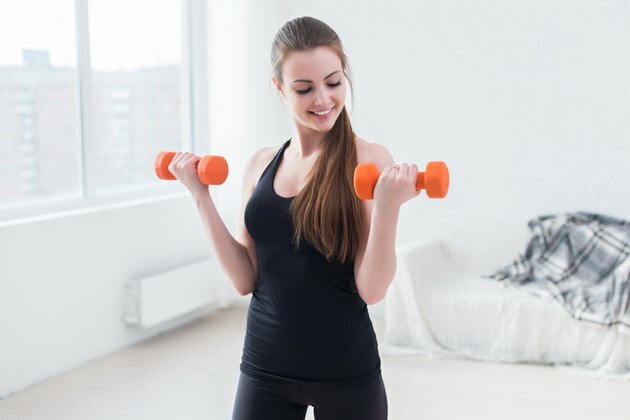 In addition, novice weightlifters experience muscle gains with as few as two lifting sessions per week, according to the National Strength and Conditioning Association. Novice lifters experience quick strength gains due to their reduced overload threshold. While novice weightlifters adapt to almost any stimulus, experienced individuals must creatively implement the overload principle for further fitness gains to occur. For example, experienced weightlifters support progressive overload by increasing load lifted, decreasing intra-set rest or increasing reps and sets performed on an ongoing basis. Learning new exercises also contributes to overload. Creativity and fitness knowledge dictates which training variables to manipulate at what time. The principle of specificity states that training adaptations obtained from an exercise program are specific to the exercise performed and muscles used. In other words, make sure your overload strategy promotes intended fitness results. Strength training comprises three different fitness goals -- improved muscular endurance, size or strength. Each goal requires special training guidelines, or specificity, along with application of overload. Rest is the least demanding yet, often neglected strength training requirement. Although adaptation demands overload, rest enables those adaptations to occur. Therefore, overload progression should be individualized and provide lifted muscles with 24 to 48 hours of rest, as stated by the NSCA. Consult a doctor before beginning a weightlifting program. What Happens to Your Body When You Work Out Too Much?